Steven Van Doren unraveled how a cancer-critical enzyme is positioned on cell surfaces. COLUMBIA, Mo. – Researchers at the University of Missouri have unraveled how a cancer-critical enzyme is positioned on cell surfaces. The enzyme enables tumor cells to tunnel through collagen, creating a convenient path for tumors to spread cancer throughout the body. This breakthrough is an important step toward the development of pharmaceuticals that can prevent and treat the spreading of cancers in the body. 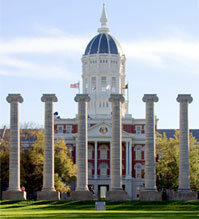 Fighting Cancer with Science from Mizzou News on Vimeo. In order to spread cancer, tumor cells must make their way through collagen, which is the most abundant protein in the human body and provides structural strength to bones and tissue. One enzyme, which scientists have dubbed MT1-MMP, can “sit” on the surface of a tumor cell and digest the collagen in its path, opening a tunnel for tumor cells to spread. The new results suggest that it may be possible to disrupt how this enzyme “sits” on a tumor cell, potentially blocking its ability to digest collagen and hindering the spread of cancer. Van Doren and his colleagues used an 800 MHz nuclear magnetic resonance (NMR) spectrometer, the most powerful NMR spectrometer in the state of Missouri, to observe how the MT1-MMP enzyme bound itself to tumor cells. The spectrometer used radio waves to track the relevant molecules, allowing the researchers to identify the specific “blades” that are critical for binding to cells and digesting collagen. The conclusions were corroborated by other measurements using fluorescent light. By shedding light on the specific positioning of these blades and the corresponding interactions with collagen, researchers have opened the door to interfering in this enzyme’s digestion of collagen, a strategy that could close an important avenue for the spread of cancer through the body. Van Doren said the next stage of research will be to identify compounds that can influence the positioning of the enzyme and block collagen digestion. Now that the enzyme is better understood, there are numerous potential applications not only for cancer research, but also for the treatment of arthritis to decrease joint damage and to decrease lung damage from the flu, according to Van Doren. The study, “MT1-MMP binds membranes by opposite tips of its β propeller to position it for pericellular proteolysis,” was published in Structure. Other researchers involved in the study were Tara Marcink, Jayce Simonic, Yan Fulcher and Narahari Akkaladevi of the University of Missouri; Bo An, formerly of Tufts University; and Anna Knapinska and Gregg Fields of Florida Atlantic University. Funding for the study was provided by grants from the National Institutes of Health (R01 GM60048, S10RR022341). The content is solely the responsibility of the authors and does not necessarily represent the official views of the funding agencies.